April 24th, 2018 – OnCrawl officially announces the integration of Google Search Console data to its dashboards through a connector. The award-winning French SEO crawler and log analyzer is completing its services with new relevant technical SEO KPIs to understand the behavior of a website in natural search results. OnCrawl Rankings addresses one of the key issues faced by search marketers and, for the first time, provides a comprehensive, cross-sectional view of natural search results performance using accurate, comprehensive and scalable data. Google Search Console is a useful tool used by every SEOs as it helps improving crawlability, indexability and delivers data about user queries. However, Google Search Console offers limited data visualisations and is only pulling up the first 1,000 user queries per site. OnCrawl is solving this problem by using the Search Console API. The SEO crawler and log analyzer is then able to retrieve all results about a user’s query, technical SEO metrics related to a page on organic results and to provide a complete picture of the URLs on a website. “With OnCrawl Rankings, we are the first solution on the market to bridge crawl, log files and Search Console data. We are thus answering a real SEO need: offering actionable data to understand how and why a page ranks on a specific result”, shares François Goube, CEO and founder at OnCrawl. OnCrawl Rankings provides search marketers with reliable data about search intent. How are visitors finding a website? What types of keywords are they using? With such data, OnCrawl offers an exhaustive list of keywords that visitors are using to search for a website. With such insights, optimizing content to match user’s intent is made easy. Moreover, OnCrawl’s Search Console integration delivers reports regarding user behavior and how they interact with search results. Click-through rate measurement lets search marketers understand why a result has a poor click-through rate ratio. Is it because of a non-optimized meta description? A lack of structured data? Doing so, any SEO can rely on precise data to improve search results’ relevance and avoid Google Rankbrain penalties. 52% of all internet users are browsing a website from a mobile device and Google is currently rolling out its mobile-first index to rank mobile versions over the desktop ones on mobile search results. OnCrawl has integrating this concern and can display its dashboards either by desktop, mobile or tablet to easily segment performance and understand behavior on search results regarding types of device. 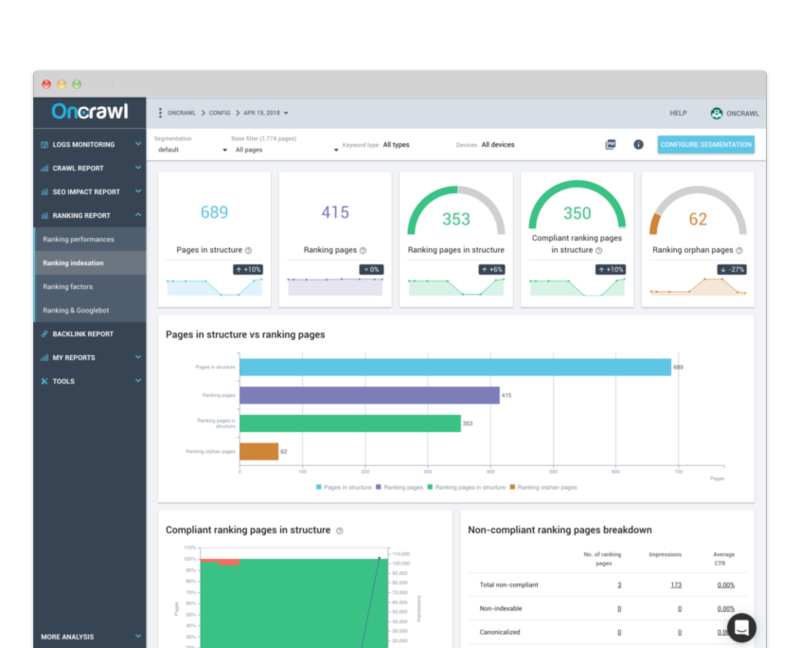 OnCrawl Rankings offers unrivaled reports to measure the impact of each SEO factors on indexation, rankings and performance by combining crawl, log files and Search Console data. Search marketers now have a reliable way to monitor indexation by detecting non-compliant pages, orphan pages, broken links or not-matching canonicals that could impact rankings. The solution also guides SEO teams to optimize the crawl budget Google is granted to a website, shows if ranked pages are impacted by a low crawl ratio or if Google is spending too much time on low quality pages. In other words, OnCrawl Rankings reveals if rankings are impacted by poorly optimized search engine crawl. The internal linking and depth distribution of a website can also have an influence on rankings. OnCrawl measures for each group of pages the impact of such metrics on impressions. Are pages located near to the homepage the ones that receive the most impressions? On the other hand, do pages close to the homepage but with fewer impressions have an optimized internal linking? Being sure that strategic content benefits from an optimized internal linking structure to improve rankings can now rely on accurate data. OnCrawl also analyzes how content quality such as duplicate, near duplicate or word count distribution is impacting impressions of ranked pages. OnCrawl Rankings gives search marketers exhaustive and reliable data they can act on to improve their rankings, traffic and revenues. OnCrawl is a powerful SaaS SEO crawler and log analyzer for enterprise audits and daily monitoring. With offices in Bordeaux, Paris and Montreal, the solution helps over 600 customers to improve their SEO performance, rankings and revenues.